Heavy good vehicles could travel down a new busy shopping street as proposals for a city centre concert hall will be examined by councillors. Updated plans for the first concert hall to be built in the Capital for 100 years, the Impact Centre, have been submitted to planners and will be determined later this month. 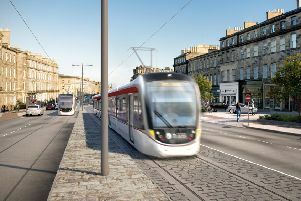 The developers, Impact Scotland, said the £45m plans are largely uncharged from the original submission - but daylight and privacy concerns have been addressed through the tweaked proposals. The management of the St James Centre have previously spoken out about traffic concerns of the Impact Centre. Martin Perry, director of development for Edinburgh St James, warned councillors that granting permission for the Impact Centre would be a “huge and damaging error”. A dedicated service vehicle route will be provided beneath the St James development. It is thought that discussions over shared use of the underground route were fruitless. Impact Scotland said discussions were continuing between the two parties. An updated transport statement shows that up to one HGV for goods and one HGV for instruments for performers could access the Impact Centre along Elder Street every day - which will form part of the new St James Centre, running between Multrees Walk and the new retail development. Articulated lorries could also be required to snake around the horseshoe driveway of the Dundas House RBS branch on St Andrew Square. In a letter to the city council, Richard Price, planning convener of new Town and Broughton Community Council, said: “Our strong preference would be to ensure that there is sufficient hard-standing at the rear of the new building to allow for waste removal and deliveries - but more importantly, adequate access for delivery vans with access from the extension of Elder Street to the square in the new Edinburgh St James development. Impact Scotland said that on a typical performance day, each project will need a single 7.5 tonne vehicle for deliveries and another for uplifts. On “exceptional occasions”, visiting orchestras “may require access to the site with a 16.5m articulated vehicle” - which are “likely to exit via Elder Street”. A spokeswoman from Impact Scotland, said: “We are looking forward to presenting our plans for the concert hall to councillors later this month. If approved, this is an opportunity to create a world class venue for the people of Edinburgh, bringing different kinds of music, audiences, performers, education, rehearsal and recording all under one roof.